I'm pretty sure I remember hearing it starting the end of this month. GAMI announced today lots of stuff. Ohata is retiring, Fairy Nihonbashi is leaving and WAVE is closing up shop. I'm not sure of the timing (I think it will close at the end of the year) but starting in April next year, it will be restructured with GAMI out and Ohka as the President. Ohata final on 12/29. The shutdown and Gami stepping down is being blamed on the (Ayako) scandal. It's hard to really imagine a reason for WAVE to continue existing these days anyway. With Ohata retiring and Nihonbashi leaving, that leaves them with what... four wrestlers? Five? I never really saw a reason for them to exist in the first place. I honestly wish they would just let it die and let the talent roam to other promotions, but I also felt that way with PURE-J too. It is pretty sad. Since I moved here in January, I've only gone to WAVE shows. They are entertaining but you could tell that they were struggling to put together shows with the regular appearances of freelancers, men and other company's wrestlers. Went to the WAVE show today. Ohka and Momono beat Miyazaki/Nozaki for the tag titles. (Nozaki looks to be doing her beat down as hell Mick Foley impression so I think she could use the time off) In a good match, Asuka beat Iroha for the WAvE title. She hit a sweet moonsault/shooting star press combo for the finish. Aya Koyama, known in Jd' and Reina as Ariya, died yesterday after a bout with breast cancer. She was also an MMA fighter. She was way to young, may she rest in peace. Acording to wrestlingdata she also was Kyusei Ninja Tsukimaru/Tsukimaru, she also worked a bunch of indies over the years. Just heard that Ray aka Lin Byron past away yesterday, just horrible news and she was still rather young at just 36. Brain tumor. Cancer is evil. When Aya Koyama was mentioned to have passed I was just wondering how Ray was doing since there hadn't been an update on her in good two or more years. Always thought she could have been a bigger deal on the scene, not huge, but more than Leon's tag partner. Ray after working for JWP met Command Bolshoi and became friends through music as Bolshoi is a very talented guitarist. Bolshoi who had appeared at Hayabusa concerts to play with him introduced Ray to Hayabusa as Ray was a very talented singer which resulted in Hayabusa and Ray becoming friends with Ray appearing when she could at Hayabusa concerts for years. Ray would begin working freelance but after it would be announced that Super Battle FMW would be starting up in 2015 and had a made a deal with Hayabusa to appear on shows the relationship between Hayabusa and Ray who had become known as the female Hayabusa got her a spot as the top women's wrestler for Super Battle FMW. From Bahu's latest update, great work from him as always, won't post the whole thing here but thought this was really touching. At the Wave show tonight, Ohata continued her "going out on her back" tour with a pinfall loss to Nozaki in a tag match. (Ohka was also pinned by Miyazaki in a tag match) But the bigger news is that her retirement road will include a tag match with her and Mizunami against The Great Sasuke and Jinsei Shinzaki. To be honest, I had no idea either of them were still wrestling. Shinzaki just had his 25th anniversary back in June. The decision match for Sendai's belt happened there. Yeah Hana turning makes little sense. Stardom is in a weird spot since it seems like there’s more going on with Momo’s title than there is with Kagetsu. Hana turning seems like it come out of nowhere, but I guess they need a storyline for the red belt. On a side note, currently on a trip to Japan and went to the last two Shin-Kiba shows. Pretty fun experience, not a bad seat in the house and both shows were great. Will post pictures if anyone care when I get back. Saori Anou showing off her new heel gear. 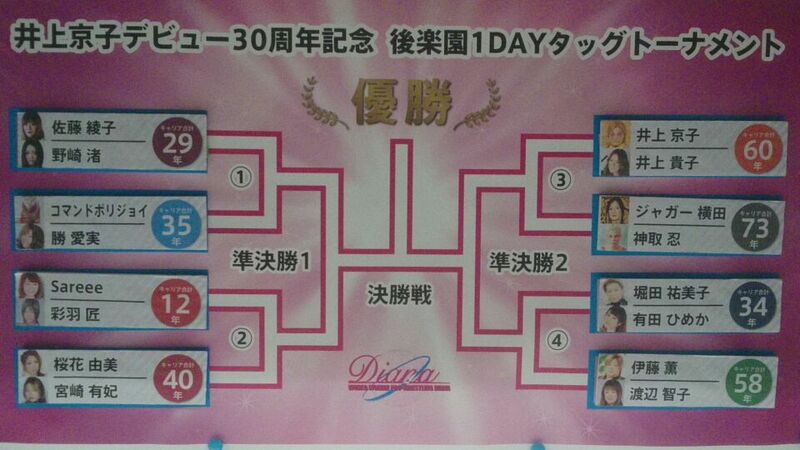 Look at this one-night tag tourney that Diana is running to celebrate Kyoko Inoue's 30th anniversary. The circled number is the combined active years for the tag team. I'm not sure who will win but I'll put big money on Himeka Arita eating the pin for her team. 30 years of Double Inoue makes me feel old. Time goes by fast. I still think of Sato and Nozaki as young girls. The tournament matches are 10 minutes. In case of a draw, the younger team advances. That's how Kandori and Jaguar won't have to take a loss.